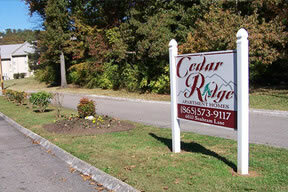 The Cedar Ridge Apartments are located in a quiet residential neighborhood. We are minutes away from downtown Knoxville and the University of Tennessee, Knoxville, campus. Do you need a refuge from the busy stress of your workday? Come join us at Cedar Ridge Apartments. At the end of a quiet street, surrounded by a verdant expanse of trees, you'll find yourself able to relax to the music of the wind through the leaves. When you choose to leave home, easy access to the Sevierville Pike as well as Chapman Highway make it easy to get to your destination. Come visit us today!